Russian President Vladimir Putin on Sunday reiterated that Russian troops will not be deployed for ground operations in war-torn Syria even as he held talks with Saudi Arabia’s Defense Minister Mohammed bin Salman, a son of the Saudi king. “This is out of the question,” Putin said in an interview with the Rossiya-24 TV channel. Russia is not going to do this no matter what happens, and “our Syrian friends know about it” said Putin. Moscow notified the US and other partners of its intentions and plans in Syria beforehand, the Russian President claimed. 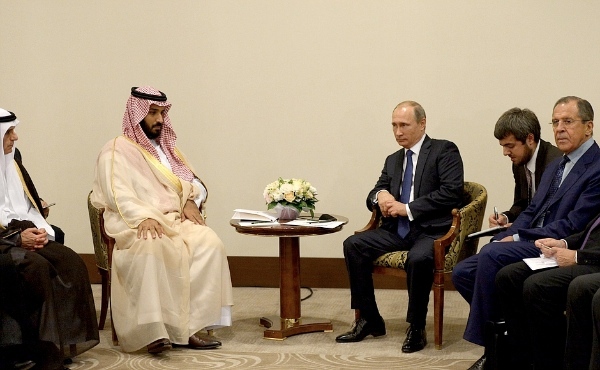 Meanwhile, in a crucial meeting with Sheikh Mohammed bin Salman on the sidelines of a Formula 1 race in Sochi on Sunday, Putin sought to address Saudi concerns about Russian airstrikes in Syria. The second goal that Moscow shares with Riyadh is “ensuring the triumph of national reconciliation in Syria so that all Syrians, regardless of their nationality or religion, will feel masters of their land,” he said. The meeting was also attended by the foreign ministers of both states. The kingdom of Saudi Arabia is a bitter foe of Syrian President Bashar Al-Assad. Russian Air Force carried out 64 sorties in Syria from Saturday to Sunday, destroying a total of 63 IS targets, including the field headquarters of the terrorist group near the northwestern Syrian village of Slama, the Russian Defense Ministry said Sunday. The Foreign Minister of Saudi Arabia, however, raised concerns about Russian airstrike targets during the meeting with Putin on Sunday. “On our part, we expressed readiness, which was met with a positive response from the successor to the Crown Prince, to begin close cooperation between our militaries, and security services in order to eliminate any doubts that the targets of the Russian Air Force are ISIS militants, al-Nusra Front, and other terrorist organizations,” Russian Foreign Minister Lavrov said. Lavrov’s Saudi counterpart Adel al-Jubeir also asserted that differences remained between Moscow and Riyadh about the future of Syrian President Assad. Saudi Arabia has stated that it wants Assad to step down. “There is no future for Assad in Syria,” Jubeir had told journalists at the UN general assembly last month. “There are two options for a settlement in Syria. One option is a political process where there would be a transitional council. The other option is a military option, which also would end with the removal of Bashar al-Assad from power,” the Saudi Foeign Minister had stated. Moscow, on the other hand, has praised the Assad government for fighting a lonely and “valiant” battle against Islamic State extremists. On September 30, Russia began airstrikes against positions of the IS and other terror groups in Syria, a move that has been criticized by the US to be mainly aiming at striking Syria’s anti-government rebels. Washington on Friday announced it was abandoning a $500m programme meant to train thousands of anti-Assad fighters in Syria. The Russian Defense Ministry has confirmed that “constructive” discussions were conducted Saturday during the second video conference with the US on implementation of specific procedures to ensure safe air operations over Syria.